According to the Manhattan Institute, 175 of the 250 largest publicly traded corporations had filed proxy documents with the Securities and Exchange Commission. These proxy filings are shareholder-initiated actions to effect changes in the corporations where they hold shares of stock. Shareholder actions are one way in which institutional owners of corporate stock, like foundations, religious organizations, and pension funds, get to raise issues for stockholders to consider. These 175 corporations faced on average only 1.10 shareholder proposals, a decline from 1.21 in 2012 and 1.18 in 2011. Corporations can, of course, file more evidence of shareholder proposals, which could lift the average corporation’s agenda of shareholder proposals, but if the 1.10 average holds, it would be, according to the Manhattan Institute, the lowest rate of shareholder actions since 2006. Some of this year’s shareholder proposals may be the products of the Dodd-Frank Act, which “mandated regular shareholder advisory votes on executive compensation, beginning with the 2011 proxy season.” If so, in terms of shareholder actions, the 2013 list would be considered quite low in terms of proposals that didn’t emanate from a legislative mandate. 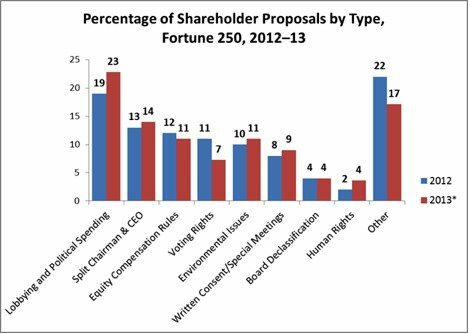 The top subject for shareholder proposals is corporate political spending or lobbying—23 percent of all of the shareholder proposals. Eleven of the corporate political spending proposals followed a template generated by the Center for Political Accountability. Sponsors of the corporate political spending or lobbying proposals came from pension funds, unions, and religious organizations. Sponsors of these proposals included labor and labor-related employee pension funds, but a significant proportion, 26 percent, came from social investment funds, including Northstar, Trillium, and As You Sow. Catholic orders significantly increased their activity, sponsoring 11 proposals as of May 2013 compared to three in all of 2012. Sadly, none of the political spending or lobbying proposals received majority shareholder support. The highest total was a 37 percent vote for lobbying disclosure at Marathon Oil’s shareholder meeting. On average, political spending proposals got 18 percent support, and lobbying proposals 22 percent. 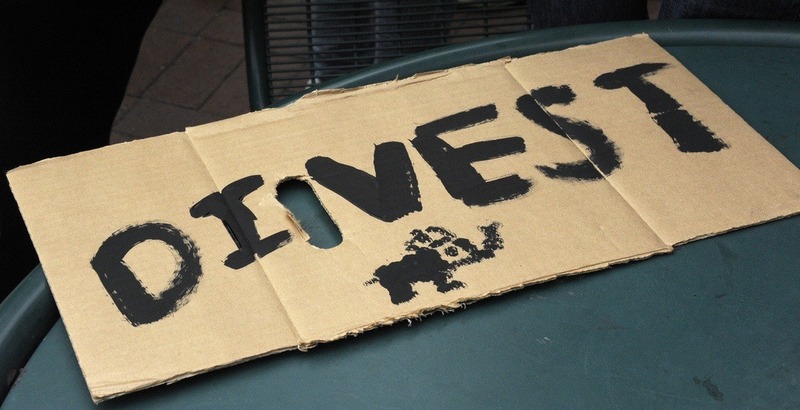 More political spending proposals are pending, including at Wellpoint and the Travelers Companies, and lobbying disclosure proposals will be voted on in May at ConocoPhillips, Altria, Allstate, and JPMorgan Chase.